Use dog toys to make a ladder for your birds! Get several double braided ring dog toys. Use shower curtain rings or zip ties to connect the dog toys in a ladder pattern. 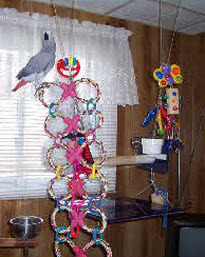 Hang the ladder for your bird using rope and hang some toys on the ladder for your bird to enjoy.